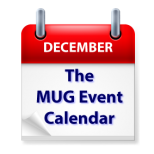 The MUG Event Calendar for the Week of December 28: A Week Off and Happy New Year! Apple User Group members and leaders must be taking the week off, because there are no scheduled meetings for this, the last week of 2015. Have a happy and safe New Year’s celebration!